Reid Schneider and Alex Hutchinson, executive producer and creative director for Army of Two, respectively, spoke about the game's forthcoming sequel at Comic-Con today. Hutchinson touched on The 40th Day's new multiplayer modes, just a bit earlier than officially planned. 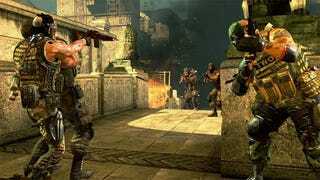 While the full, official reveal of Army Of Two: The 40th Day's versus modes will be unveiled "shortly," Hutchinson made Schneider a bit nervous with the details he offered. Our ears always perk up whtn someone starts a sentence with "I shouldn't be telling you this, but..."
The creative director said to expect a "fully client/server" connection for Army of Two: The 40th Day multiplayer, with "many more modes and more people allowed to play."